So other than making my own pants and socks and not buying that new mobile phone, what activities could be considered to constitute civil disobedience? Perhaps the best example is getting your fingers in the soil and growing some of your own food. Even a little bit. Indeed, the term ‘civil disobedience’ was coined by Henry Thoreau and related to him going off into the woods to fend for himself and avoid paying taxes to support a war that he disagreed with. You can read the original essay here, but you might just want to get out there and get some dirt under your fingernails instead! Excellent! I love the term. I agree its the best form of civil disobedience – people on mass just don’t grow their own food anymore which is a massive shame but I hold out hope that it will change. In the mean time, people like ourselves can enjoy being ahead of the game. Great looking hens by the way, I have 3 brown & whites myself. 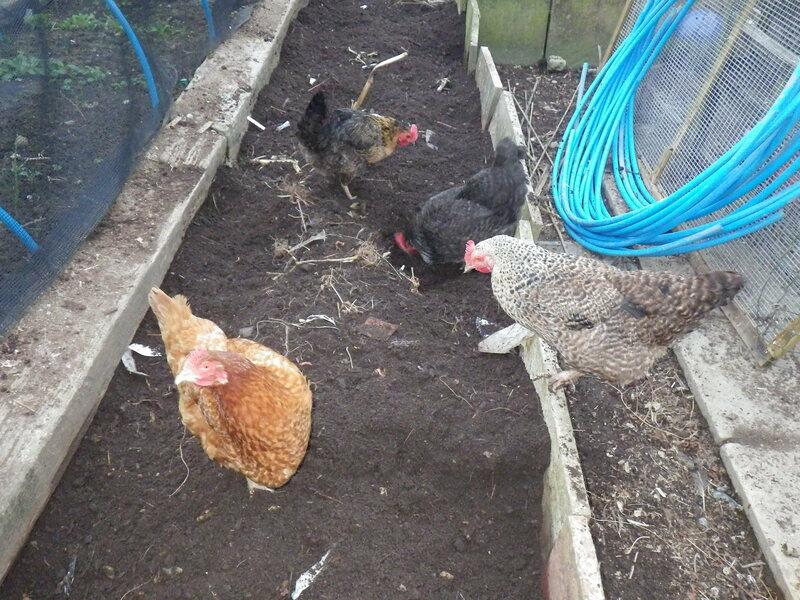 Our hens are great gardeners, but a bit enthusiastic about eating the veg! Even our neighbours have commented that they have seen a reduction in the local slug population, so they must be doing a good job. Keep up the good work in the garden!